Directions (Q.1 - 5) : Four words are given in each of the questions of which two are most nearly the same or opposite in meaning. Find the number of the correct letter combination. 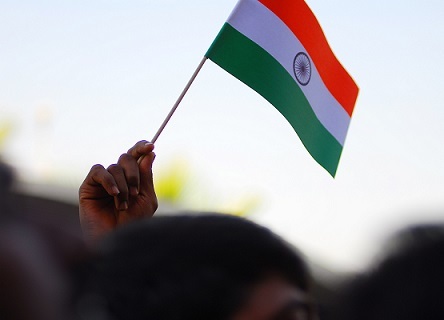 The Union Cabinet has given its approval to create a Project Development Fund (PDF) for catalysing Indian economic presence in the CLMV countries viz. 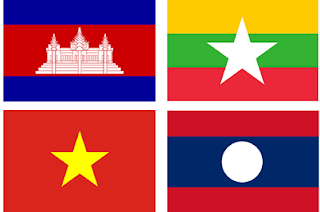 Cambodia, Laos Myanmar and Vietnam. The PDF will have corpus of Rs 500 Crore and shall be housed in Department of Commerce. It will be operated through the EXIM Bank. 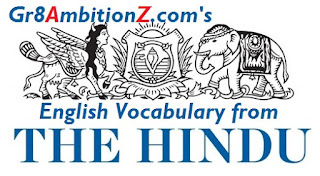 Amid protests by the opposition, the Kerala government has prohibited Onam festivities in state-run offices and institutions during working hours. The Telangana Assembly today ratified the Constitutional Amendment Bill on the Goods and Services Tax (GST), becoming the 12th state or union territory to do so. The Centre seeks to roll out the nation-wide uniform indirect tax regime by April 1, 2017. The bill requires at least 15 states' assent before the President can notify it as a law. 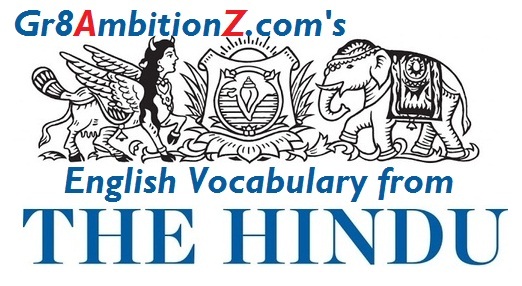 Directions (Q.1-5) : Read each sentence to findout whether there is any error in it. The error, if any will be in one part of the sen-tence. The number of that part is the answer. If there is no error, the answer is (5). 1. The traffic police have (1)/ repeatedly warned the people (2)/ against walking (3)/ in the middle of the road. (4)/ No error (5). 2. The responsibilities must be distributed (1)/ between all the employees (2)/ for effective (3)/ implementation of plans. (4)/ No error (5). 3. One must be sincere (1) / and upright in dis-charging (2)/ his duties if one wants the development of (3)/ one's country. (4)/ No error (5). 4. Had the candidate (1)/ performed satisfactorily (2)/ in the interview conducted by the board (3)/ he would definitely get selected for the job. (4)/ No error (5). 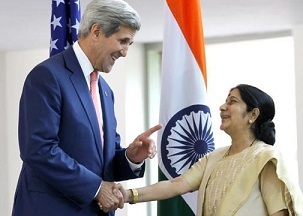 US Secretary of State John Kerry is on a 3-day visit to New Delhi. During this visit, he will co-chair the 2nd India-US Strategic and Commercial Dilogue along with US commerce secretary Penny Pritzker, Indian External Affairs minister Sushma Swaraj and Commerce and Industry minister Nirmala Sitharaman. Important Note : This is the first time the S&CD will be held in India. In New Delhi, Pritzker will also co-chair the second US-India CEO Forum alongside Jeff Zients, the Director of the National Economic Council and Assistant to the President for Economic Policy. Prime Minister Narendra Modi has launched the 1st phase of SAUNI-Saurastra Narmada Avataran Irrigation yojana today at Sanodara of Jamnagar district of Gujarat. Under the project, nearly 10 dams and reservoirs of Rajkot, Jamnagar and Morbi will be filled up with the water of Narmada river. Russia has lifted its ban on charter flights to Turkey. Earlier, Russia had banned such flights after a Russian air force jet was shot down by the Turkish military last November. Turkish President Tayyip Erdogan has since apologised for the incident and the leaders of the two countries have reportedly started restoring bilateral ties. China has launched a cargo train service to Russia in an attempt to improve trade and commerce with the country. This will reportedly save 30 days in transport time compared to shipping services and will cost 20% of standard air transportation. This is a part of China's multi-billion dollar project to revive the ancient Silk Route. 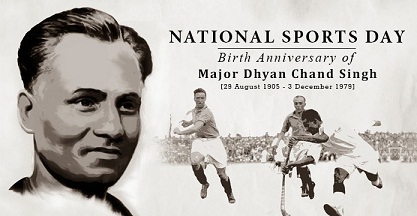 Today (29th August) is National Sports day. Note : The first National Sport Day was held in 2012. India was ranked 67th at the 2016 Rio Olympics. Which is the other country that was also ranked 67th? The 14th edition of Pravasi Bharatiya Divas will be held in January 2017 in? The Tunisian Parliament today voted to approve the new government led by Prime Minister-designate Youssef Chahed, who backs the implementation of an austerity programme. Chahed's proposal of public-sector job cuts and tax rises was backed by 167 of the Parliament's 217 members. Important Note : 40-year-old Chahed is Tunisia's youngest Prime Minister since the country became independent in 1956. 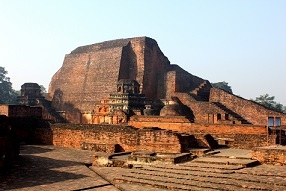 Nalanda University, one of the India's oldest institutes, conducted its first convocation in nearly 800 years today. President Pranab Mukherjee laid the foundation stone of the permanent campus of the university in Bihar's Rajgir and awarded two gold medals and 12 Post Graduate degrees to the students. Currently, 155 students are studying in the university. 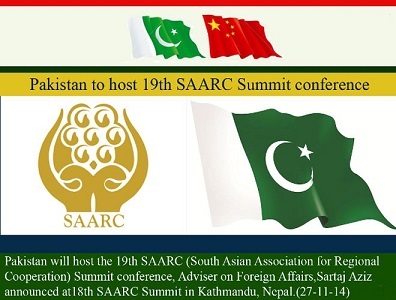 Pakistan is going to host the 19th SAARC Summit in Islamabad and Murree during 9th & 10th November 2016. It will be the meeting of the head of states or head of government of the eight SAARC countries. Besides, nine observers of SAARC have also been invited to attend the Summit. Important Note : The 18th SAARC Summit was held in Kathmandu, Nepal in November 2014. Theme : Deeper Integration for Peace and Prosperity. 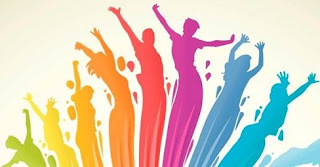 Today (26th August) is Women's Equality Day. On this day in 1920, Women in the United States were granted the right to vote. The first Children Court of South India was launched at the Nampally Criminal Courts Complex in Hyderabad, Telangana to fast disposal of cases related to children. With this, Telangana has become the third state to have a child friendly court after Goa and Delhi. This court is the 6th child-friendly court in the country. The Odisha government has held investors' meet in Bengaluru today. It is part of the celebrations to mark 80 years of Odisha and birth centenary of its former Chief Minister BijuPatnaik. Turkey launched its largest military operation into Syria, sending tanks, planes and ground forces into Jarabulus in an effort to clear the Islamic State from its last remaining frontier with Turkey. The offensive, led by Turkey-backed Syrian rebels, came days after an Islamic State-linked suicide attack in a Turkish border town. Prevention of Fiscal Evasion with respect to Taxes on Income between India and Cyprus. The revised DTAA provides for source-based taxation of capital gains on transfer of shares instead of one based on residence. Thus, it is considered as a major step in the fight against tax evasion, round tripping and base erosion/profit shifting. 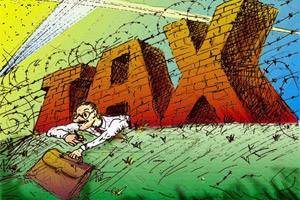 It also allows India to have the right to tax capital gains arising in India. 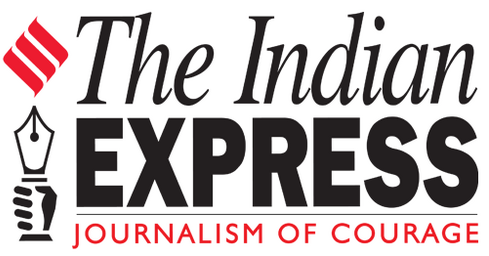 Indian Express : August 22, 2016 - "Paradox of plenty". Plough – Farm tool for turning over the soil. Viable – Able to exist. Surplus – Something left over. To let something fall or flow. Halve – To divide into two equal parts. Indian Express : August 22, 2016 - "Resolute at last". Enunciate – To state definitely. Compel – To force, to oblige. Subversion – The act of overthrowing legally constituted government. The 2 day SAARC Finance Ministers’ Conference began at Islamabad. The main aim of this conference is to discuss cooperation in different sectors of economy. The meeting is also expected to discuss the South Asia-Free Trade Agreement and devise a mechanism for promotion of regional trade. India has figured among the top 10 wealthiest countries in the world with a total individual wealth of $5,600 billion while the United States topped the chart. According to a report by New World Wealth, India was ranked 7th ahead of Canada ($4,700 billion), Australia ($4,500 billion) and Italy ($4,400 billion), which came in at 8th, 9th and 10th slots, respectively. Indian wrestler Yogeshwar Dutt's bronze medal from the London Olympics 2012 is set to be upgraded to Silver after the silver medallist from the 2012 Games, deceased Besik Kudukhov of Russia, has been stripped off his medal for using banned substance. Before the Rio games started this year, the International Olympic Committee (IOC) retested Kudukhov’s dope test sample with better technology, and it was found that he tested positive. As a result of this, his silver will be suspended and Yogeshwar’s bronze will be upgraded to silver. United States has announced 138 million dollar new aid to South Sudan. US Secretary of State John Kerry said the aid is meant for food, water, and medicine for those in need. 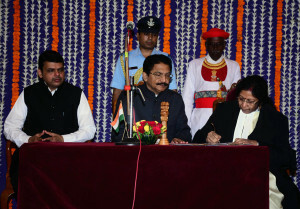 Maharashtra became the first state in the country to draft its own internal security legislation The Maharashtra Protection of Internal Security Act (MPISA), 2016. It gives special emphasis on maintaining law and order and combating terrorism, insurgency, caste-related violence and communalism in the state. In a major administrative revamp, the two-year-old Telangana government has issued draft notification on rearranging district borders to create 17 new districts. After the completion of the process, the number of districts in the State will go up to 27 from the present 10. The new districts will come into being in October. The Chhattisgarh Assembly unanimously ratified the Goods and Service Tax (GST) constitution amendment bill becoming the fifth state to pass the bill. Indian Prime Minister Narendra Modi and President Ashraf Ghani have jointly inaugurated the renovated Stor Palace in Kabul through video conferencing. Nepal's new Prime Minister Pushpa Kamal Dahal 'Prachanda' will embark on a 3-day official visit to India on 15th September 2016. Important Note : This will be Prachanda's first foreign visit after assuming office earlier this month. The 2 Day meeting of BRICS women parliamentarians concluded today in Jaipur, Rajasthan. Several issues related to climate change, gender equality, education and health were discussed at this meeting. Parliamentarians of BRICS countries shared their experiences on these issues. Total 43 parliamentarians from BRICS countries including 28 MPs from Lok Sabha and Rajya Sabha, were participated in the meeting. 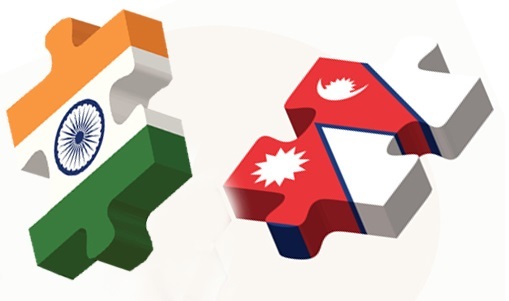 India today announced financial assistance worth Nepali Rs 3.9 crore for the construction of a new building and a hostel facility at a Sanskrit school in eastern Nepal. Yogeshwar Sangwan has been concurrently accredited as the Ambassador of India to Georgia, with residence in Yerevan (Armenia). He is currently working as the Ambassador of India to the Republic of Armenia. Note : Click on the titles to read the Editorials. Topic 1 : "Islamic State in Afghanistan"
Directions (Q. No. 1 - 10) : Read the following passage carefully and answer the questions given below it. Certain words/phrases in the passage are given in bold to help you locate them while answering some of the questions. was facilitated through amendments in the relevant Acts which permitted PSBs to raise equity from the market up to threshold limit (49 per cent) and also enabling the entry of new private and foreign banks. This changing face of banking led to an erosion of margins on traditional banking business, promoting banks to search for newer activities to augment their fee incomes. At the same time, banks also needed to devote focused attention to operational efficiency in order to contain their transaction costs. Simultaneously with the deregulation measures prudential norms were instituted to strengthen the safety and soundness of the banking system. Recent internal empirical research found that over the period 1992 -2003, there has been a discernible improvement in the efficiency of Indian banks. The increasing trend in efficiency has been fairly uniform, irrespective of the ownership pattern. The rate of such improvement has, however, not been sufficiently high. The analysis also reveals that PSBs and private sector banks in India did not differ significantly in terms of their efficiency measures. Foreign banks, on the other hand, recorded higher efficiency as compared with their Indian counterparts. 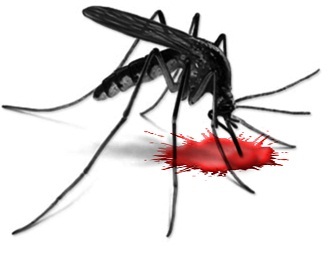 This day is a commemoration of Indian doctor Sir Ronald Ross's discovery in 1897 that female mosquitoes transmit malaria between humans. India ranks a low 39th in terms of fixed broadband adoption in the list of 53 Asia Pacific countries. It was revealed by the recently released report ‘State of ICT in Asia and the Pacific 2016: Uncovering the Widening Broadband Divide’. 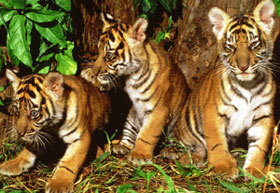 It was published by United Nations Economic and Social Commission for Asia and the Pacific (ESCAP). China and India held their 8th high-level Financial and Economic Dialogue to strengthen trade and economic cooperation between the two Asian economies. This annual dialogue is aimed at facilitating exchange of ideas and status updates on common macroeconomic policies and problems faced by India and China. This year's dialogue is being held ahead of the G20 summit in China next month and the BRICS summit in October in India. India's Economic Affairs Secretary Shaktikanta Das held talks with his Chinese counterpart, Vice Minister for Finance Shi Yaobin. 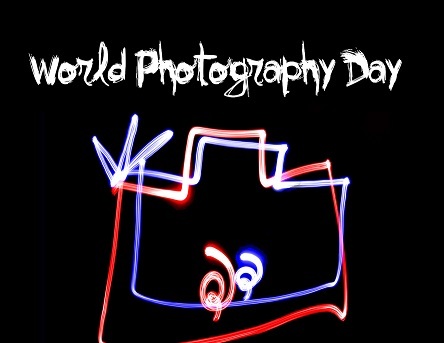 Today (19th August) is World Photography Day. Today is World Humanitarian Day (WHD). This day is observed every year on 19 August to recognize work of humanitarian personnel and those who have lost their lives working for humanitarian causes. Theme of the year 2016 : “One Humanity”. In this edition, India has jumped up by 15 spots from 81st position in 2015 GII. The annual index was released by France-based international business school INSEAD and World Intellectual Property Organisation (WIPO), a specialized agency of the United Nations. Australia has recently announced that it is going to close the controversial Asylum seeker detention centre in Papua New Guinea (PNG). 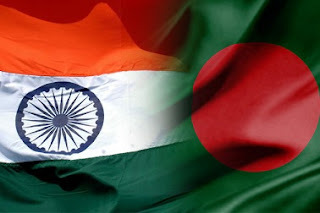 India and Bangladesh today agreed to jointly produce a documentary on the 1971 War which led to independence for Bangladesh. The decision was taken after a meeting between Information and Broadcasting M. Venkaiah Naidu with his Bangladesh counterpart Hasanul Haq Inu. The All India Radio (AIR) would begin an exclusive service for Bangladesh and the Bengali diaspora titled “Akashvani Maitree” on August 23. The Indian Council of Historical Research (ICHR) is planning to document stories and legends relating to villages and towns across India into an encyclopedia. Indian Express August 19, 2016 Don’t blame it on Rio. Cohort – Part of army. Inevitable – That cannot be avoided. Sully – To stain or discredit. Shenanigans – Secret or dishonest activity / Mischievous behavior. Gravamen – That part of an accusation weighing most heavily against an accused. Meager – Lean, thin. Too little. India's Rio Olympic stars PV Sindhu, Sakshi Malik, Dipa Karmakar and Jitu Rai were conferred the Rajiv Gandhi Khel Ratna awards today. President Pranabh Mukherjee presented the awards at a sports awards ceremony in New Delhi. 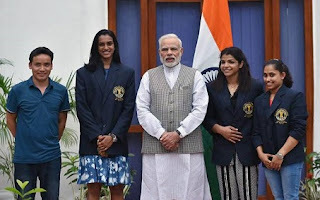 15 sportspersons were honoured with the Arjuna Award and three with the Dhyan Chand Award. Besides, the Punjabi University of Patiala was awarded the Maulana Abul Kalam Azad (MAKA) Trophy 2015-16.